Christmas is such an amazing holiday with so many wonderful family traditions. Unfortunately, for teens and other children who no longer believe, some of that excitement is lost. It's not until you grow older that you realize the true meaning of Christmas and how the holiday represents so much more than Santa Claus and presents. The Christmas Web is a brand new family tradition that includes both young and old alike and brings some of the magic of the day back to your older children. 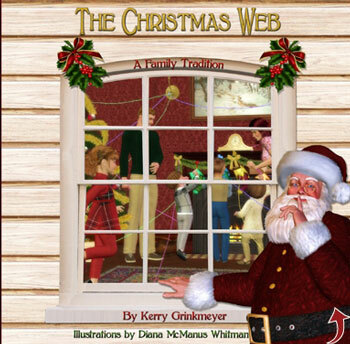 I reviewed The Christmas Web by Kerry Grinkmeyer, which retails for $39.99. Receive FREE SHIPPING with coupon code "Kobie1944"
The Christmas Web was developed to create a more entertaining and exciting Christmas morning experience for kids and big kids at heart. Inspired by a family tradition, The Christmas Web contains a storybook that tells a Christmas tale about how the Christmas Web came to be. The story describes how elves look over kids throughout the year and learn of their desired special holiday gifts. Three spools of yarn (magic wands) are also provided with the gift set. The elves use the yarn, 70 yards in length, to create a web throughout the house - around window latches, door knobs, chairs and doors - which leads to a closet or cabinet holding the special gifts from the elves. On Christmas morning, kids follow the web to their special gift. Make The Christmas Web an annual tradition for your family. Every year kids will not only look forward to opening gifts, but also experience the excitement of finding their special gift at the end of the Christmas Web. Disclosure: I received The Christmas Web in order to facilitate my review. No other compensation was received. This product review is based on my own personal experiences with this item and is completely honest and objective.